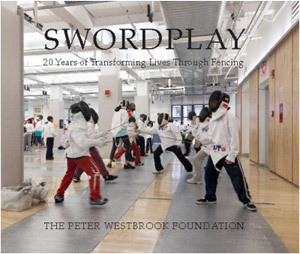 Produced in celebration of our 20th anniversary, SWORDPLAY vividly documents the Peter Westbrook Foundation's students, parents and staff through essays, quotes and four-color photographs taken by professional artists and photographs Ruggero and Valentina Vanni. The Vanni's are also parents of PWF fencer, Filippo. The 60+ images also capture the discipline and dedication of the PWF family, making it the perfect gift for the fencers and fans of fencing in your life.